.My students loved “Little Red Rolls Away” so much and couldn’t stop talking about it. They also loved the activities that Linda brought into the classroom that followed the reading of the story. Her professionalism and enthusiasm were much appreciated. Linda’s author visit will definitely be remembered throughout the year! Little Red Rolls Away is a captivating story that is a great tool for multiple subject areas and for character building. Linda was wonderfully prepared with an engaging presentation that connected with all students. We hope to read more books from Linda and have her visit again soon! The kids and I loved the book equally - have recommended to many of my coworkers. We had so much fun with Miss Linda in our Preschool class. She came and read her fun book about change and the emotions that can come with it. She is a fun author who reads with enthusiasm, and excitement! The children enjoyed following along, and making fun sounds with her as she read. She also came with different activities to go along with her book. It was fantastic! Not only did she read the book but she also asked the children questions about it and asked where he should go next. What a fun author! We thoroughly enjoyed her in our classroom. We were so excited to be able to have Linda Whalen come do an author visit at our school. My students love the interactive presentation and the materials she provided that went along with the book. We love “Little Red Rolls Away” in my classroom. My students have taken turns keeping it in their personal book bins, and reading it to each other all year long. We are so thankful Linda could come to our school this year! Thank you so much for your visit. The students loved your book and the way you presented it. So happy you have met your calling with writing. I look forward to many more books from you. We very much enjoyed your visit to Nimitz School. The kids loved your book, and interacting during your reading of it. I will follow your journey as a writer via your website and Facebook! at the school where I work. I absolutely love this book. I work in a child care facility in a health club and all my children love it. I read this book almost every day upon request. I would highly recommend it. Little Red is an excellent addition to your children's library. 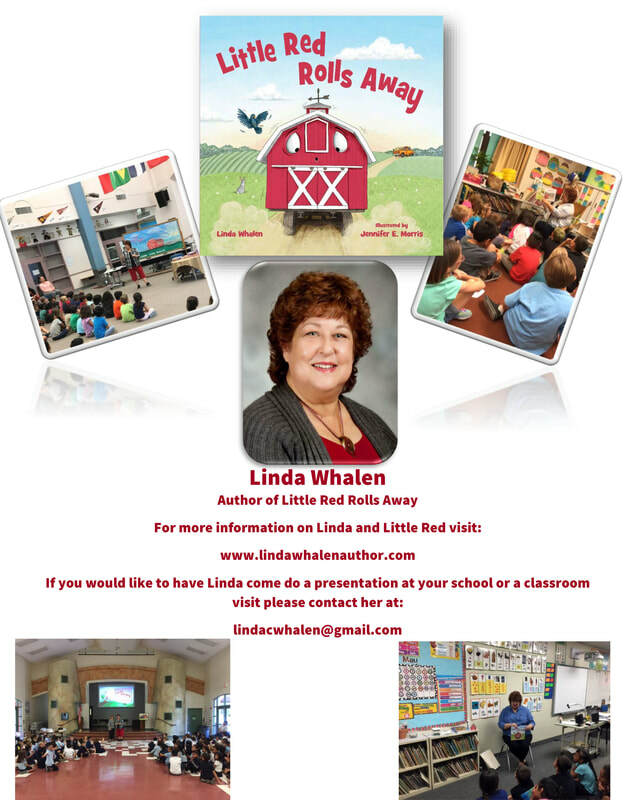 Please contact Linda for fees and or pre-orders for school visits.